The most often asked question we get these days is where to find a 4 bedroom, 2 bath home for less than $300K in Northeast Tallahassee. It was not long ago that there were plenty, but you might be shocked at how few there are today. The following list shows all available four bedroom, two bath homes for sale in Tallahassee under $300K. At the writing of this report, there are 76 homes for sale that have 4 bedrooms and 2 baths in NE Tallahassee that are priced from $300K and down, and roughly 60% of them are under contract already! This is a very popular home size and buyers must be decisive when one hits the market. Four bedroom homes are very popular in Tallahassee, and we often see buyers select them even when they do not have a specific need for the fourth bedroom. Buyers recognize the extra room as a nice feature, and they know that upon resale, the demand will be sky high. Additionally, a family which needs fewer than four bedrooms will often convert one to a den or home office, adding to the functionality of the home. For those who have frequent visitors, the fourth bedroom is nice as a room for guests. 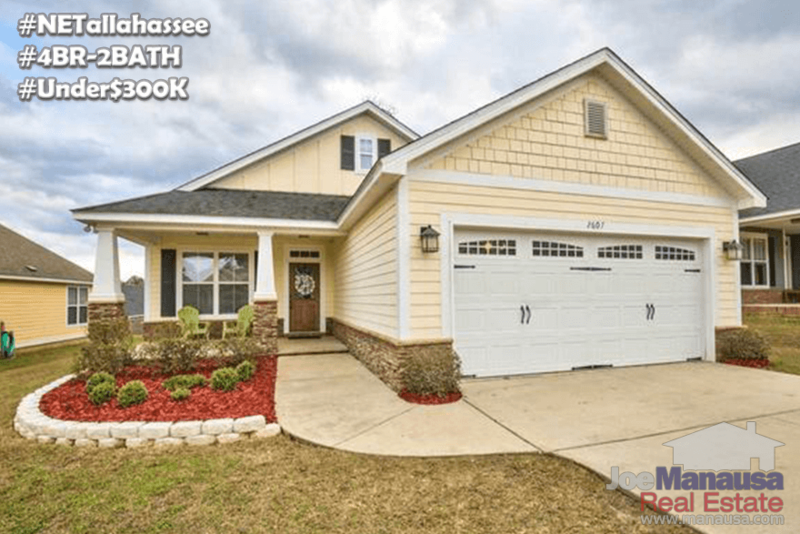 The easiest and most timely method to discover new 4 bedroom homes in Northeast Tallahassee is to set up a saved search. You can then set your alert level on the search to be as frequent as you would like. Simply go to our popular property search tool, put in the criteria you seek (location, bedrooms, baths, school zones perhaps, etc.) and then save your search and select your notification frequency. We have had several buyers call us to see a home minutes before we even knew a home had hit the market. In other words, our saved search allows you to be as informed as the real estate agents in Tallahassee. If you really want to be a savvy buyer, you should troll the following pages in order to truly have your finger on the pulse of the four-bedroom home market. Coming Soon Listings - This page shows all the listings where home sellers have "signed up" but are not yet ready to be exposed to the market. Upon special request, we can get you into these homes before they hit the market, thus giving you first shot to get an amazing newly listed four bedroom home. You can see the most recent "coming soon" listings here. Just Listed Homes - Perhaps the hottest page on our site contains listings that came on the market yesterday and today. We update this page every fifteen minutes, and we see many serious buyers bookmark this page to stay on top of the newest 4 bedroom homes. Homes Back On The Market (BOM) - Here's a rarely-known way to get a great deal on a home. Frequently, homes under contract see the deal come apart, and the homes return to the market. Often times, these sellers have already made other plans, so they have sky-high motivation to get another contract put together right away. Don't forget to troll this BOM page on our site for potentially great deals on four bedroom homes. Homes With Reduced Prices - Finally, sometimes a seller's motivation changes and they reduce their asking price in order to attract an immediate buyer. Imagine a 4 bedroom home that drops its price from $325,000 to $300,000! This might be a great find ... if you are paying attention to our page full of homes with recently reduced asking prices. The keys to getting a good deal in real estate is research, preparation, and support. Make sure you are ready to buy so that you can present a contract that a four bedroom homeowner will want to accept. Hire the best real estate buyer's agent you can find, troll the right places to find accurate and timely information on homes for sale, and be decisive when you find the right property. If you want to know more about what you can do to prepare to get a great deal on a 4/2 in NE Tallahassee, simply drop me a note and we'll be in touch right away.